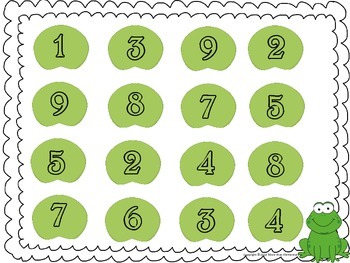 Students' mental math abilities will grow if they automatically know which numbers add up to be 10. 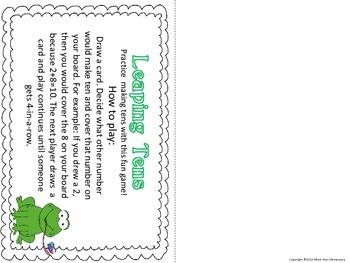 Here is a fun math game to practice adding numbers to make 10. 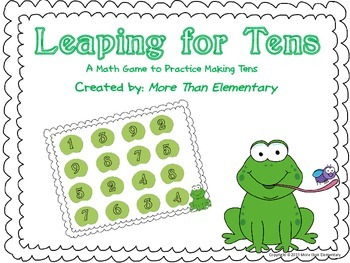 The students will love the frog and lily pad theme! "How to Play: Draw a card. 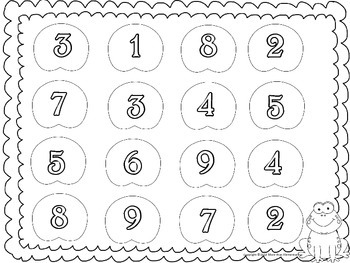 Decide what other number would make ten and cover that number on your board. For example: If you drew a 2, then you would cover the 8 on your board because 2+8=10. The next player draws a card and play continues until someone gets 4-in-a-row." Your choice between black and white or color! Both are included in this product. Please note: the total number of pages is twenty-four. Twelve of those are duplicates of the black and white product in color form.